An outdoor table in a community park area or your business's backyard will provide instant seating and an eating area for employees and patrons. There are many benefits to adding a picnic table to your outdoor space. When you add a picnic table to an outdoor recreational area like a park, you are creating an inviting place where your guests feel comfortable relaxing. This will help people enjoy your recreational area and want to stay longer, even dining in for a meal at your location instead of leaving the premises and potentially never coming back. At a business, you are showing consideration that your customers, employees or guests might need a place to sit for a while or that they might like to enjoy a meal outdoors instead of inside a cafeteria. Many locations can benefit from outdoor seating. Outdoor tables allow visitors to public parks to have a picnic, a space for children to eat outdoors at schools and child care settings, and a place for the elderly to sit in a patio area. They're also perfect for colleges, homeowners associations, and apartment complexes. In some areas, you can even add a grill so people can barbecue. For your business or organization, you can allow your employees to enjoy their break and lunch times outdoors. And for health care facilities, visitors can take advantage of a patio space while they're visiting loved ones. Outdoor tables also make the perfect spot for arts and crafts for schools, summer camps, senior centers and similar locations. They give everyone a chance to enjoy being engaged in a project, plus messes are easier to handle than in an indoor setting. You can also conduct classes and team-building exercises at a group of tables. Picnic tables are also perfect for parties. You can celebrate special occasions for students or staff members, and patrons can use these spaces for birthday parties, baby showers and other events. By adding tables to an outdoor area at a restaurant or cafe, you can create additional seating and allow people to enjoy their meal in the fresh air. This type of table is perfect for a casual eatery where people like to sit and relax for a while. No matter what you use these outdoor tables for, add an umbrella to the center to help guests enjoy the setting without the weather ruining their experience. Where outdated wooden patio tables will weather and eventually rot under harsher climates, modern outdoor furniture will last for decades. This is mainly due to material selection and the type of maintenance that is kept up on the product. Manufacturers often prefer metal or plastic to wood for commercial furniture. Customers who manage properties near the ocean will appreciate tables made out of HDPE (high-density polyethylene) simply because they will last and not be harmed by salty seawater spray. 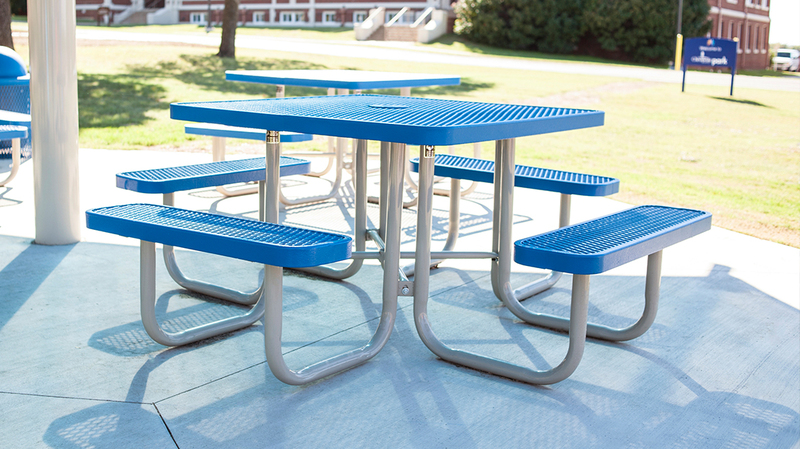 Steel furniture is a great choice for outside tables and benches, but it's preferable to have a quality primer base followed with powder-coating. Proper powder-coated paint will resist rust and last for many years. Of course, as with all things, care and maintenance goes a long way in keeping guests comfortable and aware that you care about your facility. Outdoor tables and benches need but a weekly wipe down with a wet sponge to shine. Sources suggest a bucket of warm water mixed with a small amount of dish-washing liquid will suffice.